In the first year that G and I were married I decided to return to study. I enrolled in a very serious business management subject and began my first assignment with an essay on management systems. I had absolutely no interest in management systems but I figured it would help out at work and get me one step closer to a promotion. I interviewed our CEO for the project, and then castigated our Sales Manager on his poor management skills, you know, because I now knew all there was to know about management systems. I then submitted one thousand words of what I can only imagine now was a badly referenced and wordy ramble. When my first assignment returned to me via the mailbox (because that’s how it worked in 1999) covered in red pen with a big fat fail prominently displayed on the front I was devastated. I went into my room, sat on the bed and stared at the page. I was shocked, defeated and embarrassed. I then made what had become my signature Kirsty move. I gave up. All of the energy that belonged to study simply shifted in another direction. G and I have now been married for 15 years. Over those years I’ve made murmurs here and there of more study, perhaps I could start this, perhaps I should do that. I’ve thought about businesses to begin, and considered changing careers to suit whatever location we were in at the time. I think when the children were really little I did what a lot of transient parents do and wondered if I should get a job at the school. I knew I had no interest in education, but oh how those school holidays appealed to a girl who wanted to be able to take her children home for the summer. I tried to think of things I could make, something I could sell. I went back to the office in the locations that I was able but it wasn’t always viable. I floated from idea to idea. For some reason when I began blogging it stuck. Even though it was a hobby there was something about it that kept me coming back. Instead of slowing down and petering off, over time I became more enthusiastic. I wanted to learn more about social media, I wrote more and more, attended conferences and started to follow people who made a business out of blogging. Last year when I finally put it all together and began to see how it could work I realised I wanted to do a Bachelor of Media Communication. When I looked at every subject in the degree there wasn’t a thing that I didn’t want to know more about. From Digital Media to Professional Writing it had everything I wanted to learn. After I enrolled I spoke to a fellow Aussie expat in Singapore who appeared to be blitzing her online studies. She confessed it had taken awhile to find her thing. “This is my third attempt, I started with something different and hated it, and then something else again, but I really enjoy what I’m doing now”. I was drawn to her story of how she’d kept going, there’s a certain amount of confidence required when telling friends and family that you were wrong. You’d picked the wrong thing – failed in both judgement and energy. She could have stopped after the first subject and decided that online study just wasn’t for her. I wondered if her friends or family made quiet observations/judgements about her lack of finishing? And then I realised she’d done something that most of us struggle to do. She’d given herself the permission to fail. 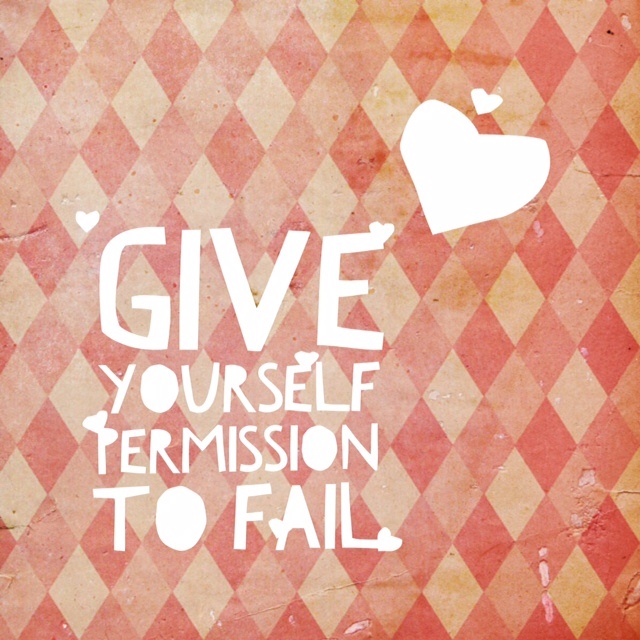 We need to give ourselves permission to fail. Maybe you’re like me. Maybe you stopped work for six months to have a baby, seven years ago. Or maybe you went back to work but had to accept something that worked around your children? Or maybe you’ve somehow just got stuck doing something you no longer feel is you. You’re allowed to speculate, you’re allowed to enrol and not finish. You’re allowed to share an idea that never originates. You’re allowed to dream, to plot, to plan, and to never get going. All of those things are a step towards you finding your thing. I’ve just completed my first four subjects. The past ten months have involved returning to the library, sitting up at 3am on a school night with an assignment deadline, and listening to lectures online while driving around Doha. I’ve missed events with the kids, stayed inside studying while others have walked on the beach, and declined nights out with the girls to fit it all in. And as much as I’ve whined and lost sleep – I have adored it. One morning earlier this week I opened my email to discover I’d received my first distinction. I sat on my bed, stared at my result, this time without the embarrassment or shame.